Saint Lizier is an ancient roman town rich in art and history and which is officially classed among the most beautiful villages of France and is almost entirely listed on the UNESCO world heritage register. Situated at the foot of the Pyrenees the city has a magnificent setting with a view of the mountains of the Couserans region, it is one of the rare villages in France to possess two cathedrals and is listed on the heritage register as being on the road to Santiago de Compostela. The village dates back to Roman times and its lovely narrow cobbled alleyways within the old ramparts are home to some 15th – 18th century half timbered houses. Architecturally the most interesting building in town is the Cathédrale de St-Lizier , with its distinctive octagonal tower posing picturesquely against the mountains to the south. Inside are some twelfth-century frescoes faded almost to invisibility, and a fine Romanesque cloister, also twelfth-century, with an array of unique, sculpted column capitals. A second cathedral, Nôtre-Dame-de-Sède, within the grounds of the bishop’s palace, is also home to the Musée Départmentale de l’Ariège. The town has a bakery, cafés and two excellent restaurants, one situated in the Bishop’s Palace with stunning views over the village and to the mountains beyond. There is also a hotel and primary school. The town of St Girons has a wonderfully picturesque location, in the foothills of the beautiful Pyrenean Mountains, close to the border with Spain. Above the town the peaks jut into the skyline, snow clad in winter and green and inviting in summer. The ski resorts are close at hand, and both the Mediterranean Sea and the Atlantic Ocean are within two to three hours travel. 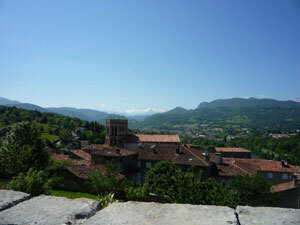 St Girons is at the gateway to the Couserans Valleys, a series of 18 valleys which make up a third of the Ariège region. 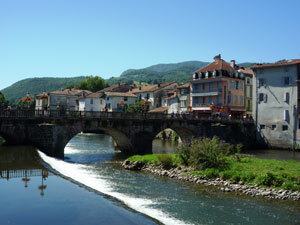 St Girons is a charming and lively town with some 7,000 inhabitants. It is the commercial heart of this sparsely populated and mountainous region, and also attracts a good number of visitors, both to enjoy its olde worlde ambience and also to attend its excellent street markets. Local pink marble is used to pave the picturesque streets, and there is a good selection of restaurants, bars and cafés. Under the recently restored Pont-Vieux in the centre of the town you can see trout swimming the clear waters of the River Salat which flows straight down from the mountains. The bridge leads you towards the old commercial centre of the town on the right bank, with some marvellously old-fashioned shops, their fronts and fittings unchanged for generations. To the right, past the tiny Cathedral, are the elegantly faded Grand Hôtel de France and the equally old-fashioned Hôtel de l’Union, where you can still stay. The latter’s ground-floor café is a splendid balconied period piece facing the riverside Champ de Mars, the back half a wonderfully old-fashioned book shop, worth visiting for the interior alone. The central square, shaded by Plane trees, provides the site for the famous Saturday morning farmer’s market which attracts locals and visitors from miles around. The town has all amenities; lots of interesting and useful shops, bars, restaurants, cinema, sporting facilities including an excellent tennis club, rugby and football stadium and outdoor swimming pool as well as primary schools, a secondary school and two lycées. The town also hosts a series of festivals throughout the summer. In the winter you are only a hop away from some great skiing and snowboarding territory at Guzet Neige, just a 40 minute drive away, and in the summer the mountains are fantastic for anyone who enjoys walking, mountain biking, pony trekking and generally enjoying the spectacular scenery of the great outdoors. There were a number of escape routes during the World War Two through France but the Comete Line, the Pat O’Leary Line and the Marie Claire Line were the most famous. One of the O’Leary networks went through central France to Agen & Toulouse then to the central Pyrenees to the starting point of “Le Chemin de la Liberte” at St Girons. The high mountain route into Spain was carefully chosen as it avoided all official checkpoints. Between 1940 & 1944, there were 33,000 successful escapes along the entire length of the Pyrenean chain and 782 escaped over the mountain peaks of the Ariège. During the war several escape trails were established near St Girons and other towns and villages surrounding it like Foix, Tarascon, Aulus-Les-Bains, Massat, Castillon, Seix & Sentein all had invisible mountain routes towards the Spanish frontier. By the beginning of 1943 German surveillance had increased often due to the betrayal by Frenchmen who worked for the feared Vichy-run paramilitary force “La Milice” and there were many ambushes along the trails. Despite this increased surveillance the St Girons-Esterri escape route via Mont Valier remained operational until the end of the war. Today, each year, a guide leads a group along the trail to commemorate those who made it and those who did not. 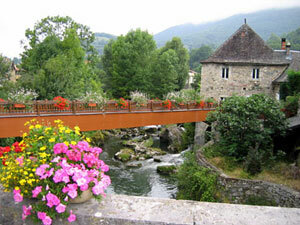 A very typical Couserans village with a river running through and picturesque walks in all directions. This is where the local Moulis cheese is made. There is also an ecological research centre here; the French National Centre for Scientific Research, which attracts scientists from all over the world to study, amongst other things, biological diversity, animal perception and decision making and adaption to new habitats. Part of this set up includes an underground laboratory. 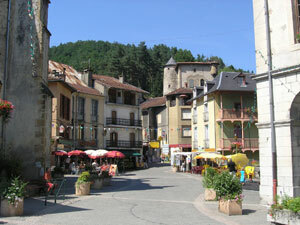 Moulis is a thriving town very close to St Girons but with all its own facilities including a shop, restaurant, bar and primary school. The capital of the Haut Couserans in the Ariege, situated at 600metres, this pretty town is the perfect place for those enamoured by the mountains, summer and winter. It has all amenities including hotels, restaurants, cafes, shops and primary and secondary schools and is just twenty minutes south of St Girons. It is also an active ‘centre of tourism’ thanks to its proximity to the ski resort of Guzet, the spa town of Aulus les Bains and to the Mont Valier national park and being the perfect setting off point for hundreds of walking trails into the valley and mountains, as well as for horse riding and kayaking or fishing on the network of rivers in and around the town. A fortified medieval village and Huguenot citadel situated on the top of a hill with wonderful views of the surrounding valleys and mountains of the Ariège. One of its most famous inhabitants was the philosopher, Pierre Bayle. It is possible to walk around the village along the ancient and beautiful ramparts passing equally stunning houses. Carla Bayle is famous for its inhabitants who are mainly artists, hence the numerous beautifully painted houses and colourful shutters around the village. Many art exhibitions are held here throughout the year. There is also a man-made lake just below the village, set on 12 hectares which is open all year round. Facilities include swimming, windsurfing, fishing & canoeing. The lake also has a picnic area. Carla Bayle has a market each Sunday morning. Like other spa towns, Aulus was once an extremely elegant and fashionable place to be. Nowadays its elegance is rather faded but it is, nonetheless, a very agreeable and peaceful town just over half an hour from Saint Girons, situated at 750 metres altitude and set in beautiful mountain meadows with a dramatic backdrop of snowy peaks. This is country for walking and enjoying the landscapes and for enjoying the health benefits of pure mountain air and thermal waters. 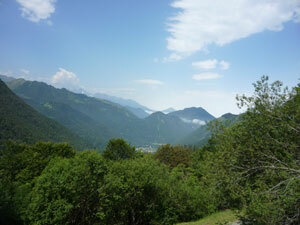 It is a popular starting point for the walk to the Cascade d’Ars, the second highest waterfall in the Pyrenees. Aulus and its surrounding villages were once renowned for their bear-trainers, who, driven by poverty, toured the lowland towns with their performing beasts. Guzet Neige is a charming winter mountain resort set in beautiful surroundings just 40 minutes from the town of St Girons. Particularly popular for skiing with local families, it has a good variety of terrain for all abilities and an annual snowfall average of six metres. Investment in the last few years has meant new, quick and efficient lifts and snow cannons; in all there are 14 lifts offering 1000 metres of vertical descent and 31 pistes with a total length of 40 kilometres. There are also four kilometres of cross country ski trails. 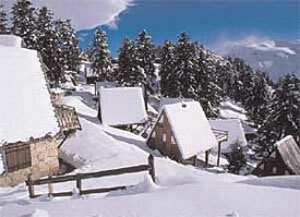 Guzet has numerous restaurants and cafes and is a great day-trip destination for people living in the area. Skiers, boarders those on snowshoes and families wanting to enjoy some sledging and time in the snow will all have a fantastic day out here. 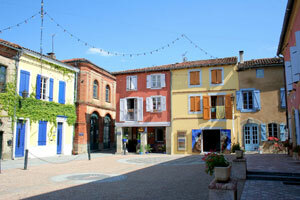 The town of Maz D’Azil is a medieval bastide (walled town) with some beautiful timber-framed houses and an attractive market hall in which a colourful market is held on a Saturday. The local inhabitants, like their distant ancestors, still farm honey and asses milk and it is possible to visit the local donkey farm to buy soap made of pure asses’ milk based on a traditional recipe or try drinking some which is said to prevent your skin from ageing. This area has been inhabited for over 35,000 years, established by the discoveries made in the Palaeolithic Cave de Mas d’Azil just outside the town, excavated by Edouard Piette in the 19th century. This grotto at Mas d’Azil was one of the first prehistoric caves to yield evidence of human habitation and is an exemplary site of a prehistoric dwelling. 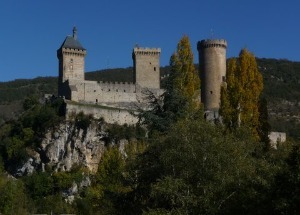 It also served as a refuge for local persecuted people, some Cathars and also Huguenots. Occupations at the site range in date from 17,800 to 6500 years BC. Also some Gallo-Roman remains which are about 2,000 years old were discovered. The main road runs through the grotto and inside it is a Museum of Prehistory. Not far from Maz D’Azil is the famous underground river at Labouiche. A visit here includes the longest subterranean boat ride (1,500m) in Europe. About 4km of the river are accessible by boat with a guide. The capital of Ariege is Foix, an ancient and pretty medieval market town with much charm and a very genuine atmosphere watched over by its fine fortress, the Chateau de Foix. Two rivers and one mighty rock surround the town giving it a very picturesque natural setting. The castle has been attacked many times without anyone succeeding to capture it. Simon de Montfort once vowed, quite ambitiously, to ‘melt the rock of Foix like fat and grill Cathar count Raymond Roger in it’. However, after a few attempts at storming the castle he gave up and decided to burn the town down instead. The castle has also been used as a prison and the names of English Prisoners of War can still be seen on the old cell walls. The town offers a good selection of restaurants, pizzerias and crêperies and there are street markets throughout the week. There are also schools, the main hospital of the department, a cinema and lots of interesting shops. 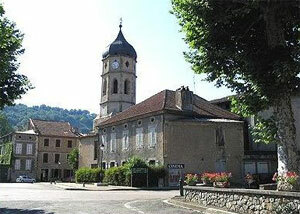 Please read the notable towns in the Haute-Garonne guide.